Ever try and make a game kids and adults can play together? Ever get that game to be fun for everyone? Yeah me neither. It’s super-hard to find a challenge that can engage a wide age range that encompasses kids under 6. That’s one of the reasons I’m so excited Wise Guy Events will be bringing their game Høot Patøoter to Games for Change this year. 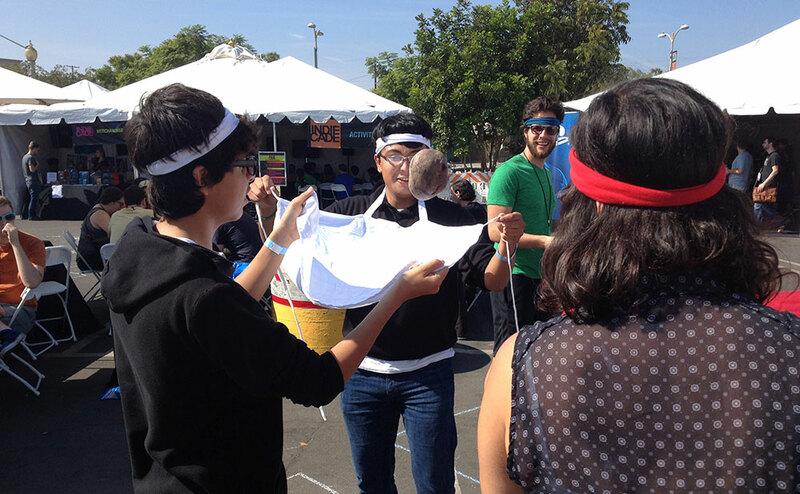 Wise Guys Events, based in Southern California, produces live event games. Their cartoonish cooking game Høot Patøoter mixes foursquare into a family-friendly, food fight game played with real produce and a chef who is Swedish. The game won Best Family Game at last year’s Come Out & Play Festival. I really love the work Greg Snyder and Myles Nye do at Wise Guys. Høot Patøoter is a pretty simple game, but one that produces both great theater and interesting multi-generational play. 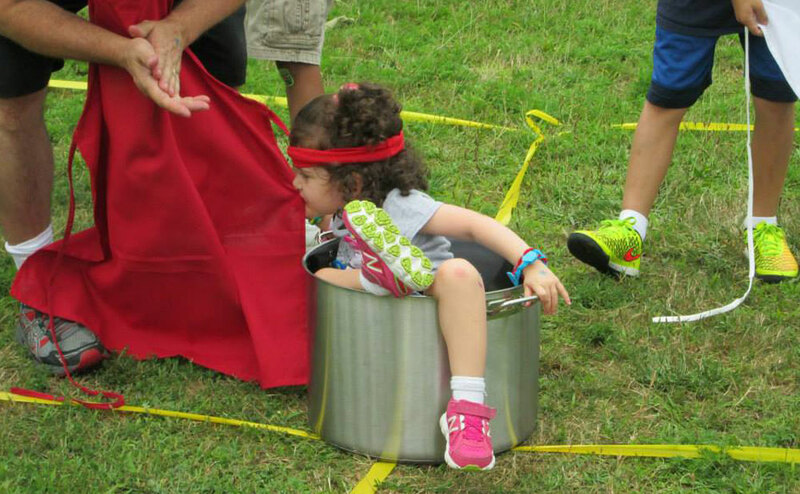 Teams compete to catch vegetables with an apron and then dump them into a pot when the ingredient is called for. Played in small teams of two, the game allows for a radically wide age range to play together. This is no easy feat. Most of the time the design of a game leaves somebody out. It’s either too hard for little kids or too easy for older players. When I played Høot Patøoter last year at Come Out & Play, I played on a team with my 5-year old son, while my wife teamed up with my 2-year old son. We all competed against players of varying ages from teens to 20-somethings. And Wyatt and I came in second, while my wife and 2-year old Miles tied another team for first. Normally a game would have to greatly privilege the younger age to accomplish this balance. Or the game master would have to be intentionally rubber banding the game. And while Greg, who was running the game was definitely keeping it fair, he wasn’t letting us win. I think teams of two using the apron to catch items really allows for a nice dynamic balancing. An adult paired with a child can compensate for the kid based on their ability. So my 5-year old was able to help move around with the apron with me to catch things. My 2-year old simply had to keep it around his neck on his end to help make a catch, while my wife moved the other end of the apron. Either way the adult is challenged (catching and throwing vegetables with an apron is hard!) and the kid doesn’t feel coddled. Seems simple but it isn’t. It’s like teammate powered dynamic difficulty adjustment. I’d love to see more family oriented games really take advantage of this sort of model, rather than simply leaving adults to act as rule enforcer. When everyone is challenged, everyone has more fun.